Inspired by spanakopita, this simple tart is loaded with greens and fresh herbs encased in a hazelnut tart crust. It’s just as delicious served at room temperature, and both the crust and filling can be made in advance for easy preparation. 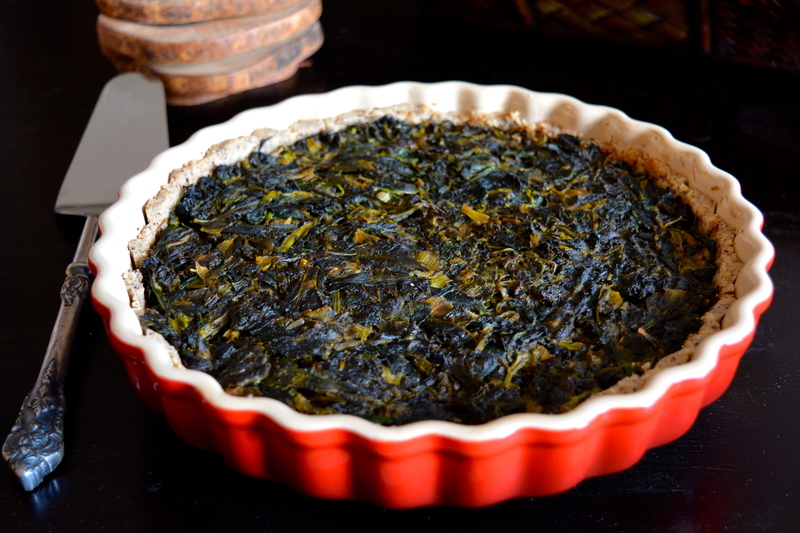 Preheat the oven to 350 degrees F. Lightly grease a 9-inch tart dish. To make the crust, put the hazelnut meal, tapioca flour, and salt in a food processor. Pulse about 8 times to combine. Put the buttery spread in the food processor. Pulse about 10 times until the buttery spread is in small pieces. Turn the processor on and drizzle in the water just until the mixture sticks together. Press the mixture into the bottom and up the sides of the prepared dish. Bake on the middle rack for 12 to 15 minutes, until firm. If it starts to puff up, gently press it down. Set aside. To make the filling, put the olive oil in a large saucepan over medium-high heat. Add the spinach, kale, and green onions, and cook until wilted and softened, about 10 minutes. Add the dill, mint, and garlic, cooking until fragrant and softened. Add the salt and lemon juice. Cook until all liquid has absorbed. Transfer the mixture into the tart shell, pressing evenly. Bake for 25 to 30 minutes until crust is golden on the edges and the filling is firm to the touch. Cool at least 20 minutes before serving.